While not as well known or widely used as Wi-Fi or Ethernet, powerline networking—using your existing home electrical wiring to transmit data, turning every outlet in your house into a potential network connection—can be a lifesaver when Wi-Fi won’t reach or when you can’t (or won’t) run Ethernet cabling. Whether powerline networking is better than Wi-Fi or Ethernet for a particular application depends on several factors: how much speed you need, how solid the connection needs to be, how much you can afford, and how good your house’s wiring is. Compared to Wi-Fi, powerline reaches anywhere in the house with consistent bandwidth—meaning no dropouts. But it’s also much more expensive than Wi-Fi. Starter kits that will attach one device to your network start at around $140, with additional adapters costing $75 each. And if your wiring is noisy or made of aluminum, or if you have multiple breaker panels and outlets that create distinct circuits, powerline may not work in your house at all. Compared to Ethernet, powerline reaches anywhere in the house without running new wires but is much slower. The latest powerline gear is rated at 200 Mbps, or about 100 Mbps in real-world usage. That’s about the same as 802.11n Wi-Fi but only one-tenth the speed of Gigabit Ethernet. Pricewise, powerline may actually be cheaper than running Ethernet cable between distant rooms. Networking Remote Locations Powerline is perfect for providing access in areas of the house where your Wi-Fi signal is weak or nonexistent and where it’s too inconvenient or expensive to run Ethernet. Extending Wi-Fi Access Need Wi-Fi in that attic suite or apartment over the garage where your main base station doesn’t reach? You can buy hardware that combines a powerline adapter with a wireless access point (see below). This means that you can create a Wi-Fi net almost anywhere there’s a wall plug. You could also plug a Wi-Fi access point (such as an AirPort Express configured in access point mode) in to a powerline adapter. The biggest trick in buying powerline hardware is distinguishing among the three incompatible powerline standards out there. The leading standard, which has the most support from vendors and is the one I recommend, is HomePlug AV. HomePlug AV products are rated at 200 Mbps and are available from vendors including Belkin, Linksys, Netgear, ZyXEL, and several others. (A) Plus six AC outlets on power strip. The other two standards are HD-PLC (High Definition Power Line Communication, from Panasonic) and UPA (Universal Powerline Association, from D-Link, Netgear, and some others). Two earlier versions of the HomePlug standard, 1.0 and Turbo, are also still available, but they are much slower (14 Mbps and 85 Mbps, respectively), they aren’t interoperable with HomePlug AV, and they’re mostly inconfigurable from a Mac. There’s a lot of this older gear still floating around, so be sure you order HomePlug AV adapters if you decide on powerline. Also be sure to buy from a store with a good return policy, in case your home wiring is not up to snuff. When powerline works, it’s great, but until you test it out in your house, there’s no guarantee that it will operate at all. Finally, stick with one manufacturer. While HomePlug AV hardware is supposed to be interoperable, any problems may be hard to resolve across multiple vendors. In rooms where you need to connect multiple devices, consider Belkin’s new Powerline AV+ kit, which has three Ethernet ports in the remote adapter rather than the usual one. It’s an economical solution for living rooms with multiple networked media and/or game boxes. 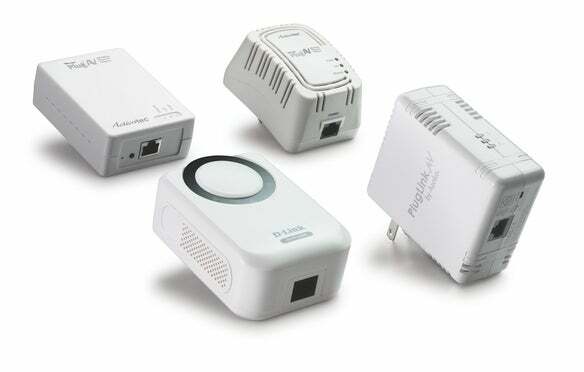 If you want to create a Wi-Fi net from a powerline adapter, powerline access points (compatible with HomePlug AV) are available from Actiontec and ZyXEL, among others, for about $120. These can be configured on your Mac using browser-based utilities, just as standard Wi-Fi routers can. Most HomePlug AV adapters are plug-and-play; you plug one adapter in to your router via Ethernet and into an electrical outlet. You then plug another adapter in to another outlet on that same electrical circuit for each peripheral you want to connect. That should be it: no setup or software involved. The connection will look like a standard 100 Mbps Ethernet connection to your Mac or other attached devices. Some powerline gear is not so easy to set up, requiring software setup of each adapter from a Windows PC. If that’s the case, don’t let it stop you from using powerline; you’ll need to borrow a PC just this once. To work properly, powerline adapters should be plugged directly in to the wall, rather than in to a power strip or extension cord. If Apple’s wireless hardware isn’t doing the job, here are your best alternatives.